Copyright Shapla Neer All Rights Reserved. "Shapla Neer=Citizen's Committee in Japan for Overseas Support" is a Japanese non-governmental organization established in 1972. With the aim of realizing a society that enables each person to develop to that person's greatest potential, it has been engaged in addressing various issues facing society today, including disparities between developed and developing countries. In particular, it has been working in Japan and overseas to address challenges experienced by people living in poverty in South Asia. Shapla Neer was established 45 years ago, and over the years it has accumulated a wealth of experience and lessons learned that would be valuable to share worldwide. Here, we introduce the organization to JFS readers, with text we have adapted with Shapla Neer's permission from the history page on their website. In the spring of 1972, about 50 Japanese youths went to Bangladesh, a country that had just gained independence the year before. The group was named as "Bangladesh Agriculture Reconstruction Volunteers." These volunteers witnessed first-hand many contradictions of development aid. They found that those really benefiting from "aid" were already rich, while the bulk of the population, most of whom were poor, received nothing. At the same time, many of the Japanese youth became strongly attracted to the beautiful nature and humanity of the people of Bangladesh. Returning to Japan after the four months of valuable experience, some of them asked themselves a serious question: "What is the best way to support the people in Bangladesh?" As a result, an organization was founded to continue the work in Bangladesh. Some of the youth formed "the Help Bangladesh Committee" (HBC), a predecessor to what is now Shapla Neer. Funds for HBC came from donations collected on the streets of Shinjuku. 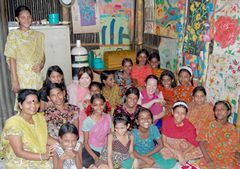 The first thing HBC did was to go into the villages of Bangladesh and distribute notebooks and pencils to the children. As a result of the war of independence and natural disasters such as drought and cyclones, Bangladesh was in a desperate condition, and relief supplies were coming in from all over the world. However, the supplies disappeared before arriving in the villages where people were in need. So when HBC members arrived, villagers were delighted, saying "This is the first time for the village to receive relief supplies." However, when we visited the village market, many of the notebooks and pencils that had been distributed the previous day were sold the next day. This was our first failure. We had assumed that if we gave children notebooks and pencils, they would be able to go to school the next day. In Bangladesh, soon after the independence, some people died from hunger. We later came to realize that the children probably sold the notebooks and pencils so that they could pay for food, and stave off hunger. We made the same mistake as governments, although we had criticized government aid as useless. After much reflection, we sent our staff members from Japan and they lived in a local village in Bangladesh. We thought that if we had eaten what the poor ate, had spoken in the same language, and had lived with them, we would have been able to find out what they truly needed. However, in 1977, the local office was attacked by a group of robbers, gravely injuring our Japanese staff there, and we had to once again seriously consider what we had done. Had our aid been self-centered? Did we fail to fully understand local culture and customs? Did our actions cause new friction? 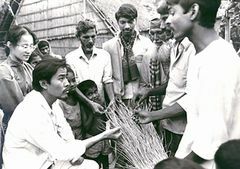 In 1980s, we started supporting the rural communities and youths to initiate their own activities to boost the development of their own villages by themselves. In 1987, we changed to a direct approach by having the village groups work under Shapla Neer. While this change brought us smooth management of the organization and local activities, our local staff gradually adopted the "employee" attitude, which meant less of an attitude of "serving" the community. We experienced an outbreak of workers' strikes in 1997 and many other complications. As a Japanese NGO, what can we do in South Asia? From 1999 to 2005, we split our original village office into three independent local NGOs so that local staff and resident Japanese staff could be more actively involved in regional issues. After asking ourselves what we should do as a Japanese NGO, the answer was clear; we should focus on those neglected people in Bangladesh's society as a result of urbanization and economic development. This perspective led us to start supporting street children in Dhaka in 2000. At present, we support activities for those left behind by development, such as child workers, youths living in disaster areas or slums, the elderly, and the disabled. We have just two staff members in Bangladesh and one in Nepal, so it is the local people who play the biggest role in improving their own lives by working with NGOs based in Bangladesh or Nepal. Our basic style is to support people to "improve their own lives for themselves." We are careful in our activities to ensure that the local people would not rely on us too much. We think it is important not only to directly support those left behind, but also to support communities so that they can help the people. At the local level, we also started offering cooperation to enhance the capacity of our partner organizations to engage in advocacy in society through the media and to collaborate with the governments. We have been witnessing the effects. In Bangladesh, most of the food for school lunches in drop-in centers for street children is provided by shop owners in the communities, and local people have become instructors in cooking schools at support centers for young women employed as domestic workers. Our original mission was to improve the lives of those living in rural areas of Bangladesh. As we locally conducted projects, however, we came to feel that these problems were not just someone else's problems, but ours too. Now we can see Japan through Bangladesh. How are the rural communities and issues of street children related with issues in Japan? We would like to think deeply from this perspective. We are finding that "offering cooperation" may not be enough. As a basis for our activities, we would rather choose "coexistence" than merely offering assistance. For these activities we have been recognized with the following awards: Yoshikawa Eiji Cultural Award, Tokyo Bar Association Human Rights Award, Foreign Minister's Special Commendation, Mainichi International Award, Asahi Social Welfare Award, and Okinawa Peace Prize. Furthermore, our activities were introduced in some textbooks for junior high and senior high school students. Shapla Neer operates on five main principles: Do not simply provide aid. Encourage people to find solutions by themselves. Think things out together. Learn from the real frontlines. And leave no one behind. In its activities, the organization defines poverty as a condition in which people are hindered from exercising their full capabilities. Shapla Neer aims to realize a society that has no poverty, by creating the space for transformation and relationship. In their mid-term vision for 2016 to 2020, they have established three priorities: (1) protect children's rights, (2) develop disaster-resilient areas, and (3) create a society in which all can coexist through fair trade. We at JFS look forward to seeing the further development of Shapla Neer as it continues to evolve and make good use of its extensive experience.